Recorded in sevarl forms including Arcas, Arecase, Harcase, Harcass, Harcus, Harkess and Harkus, this is a Scottish locational surname. It originates from an estate known as 'The lands of Harcase' in the parish of Fogo, in Berwickshire, but today is to be found even as far away as the Orkney Isles, and often in the dialectal forms of Harcus and Harkus. The nameholders have a long tradition, and originating as they did from the then infamous Border Country, which saw some of the fiercest fighting between Engalnf and Scotland as well as innumerable local feuds, it is perhaps not surprising that it is a surname whch has been much involved in bloody conflict. 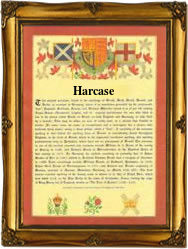 However this was not always the case the first recorded nameholder was one Adam de Harcarres as spelt, who was elected the abbot of Newbottle in 1216, whilst the name reached gentry status on shortly afterwards with Sir Alan de Harecares being so recorded in 1259, and further afield Robert Harcars was sherrif of Perth in 1306. Sometime in the 15th century it would seem that for unexplained reasons a number of members of the clan moved to the Orkneys. It is possible that this move was not voluntary because in 1539 three men called 'Hercas' were associated in the murder of John, Earl of Caithness, and it seems, paid the supreme penalty. However this does not seem to have prevented one James Harcas being elected to the Scottish Parliament in 1605. It is said that the name is now very rare.